An indoor/outdoor water fountain is a great way to add a peaceful accent to your decor. This design features three stunning sandstone texture faux stone jugs set atop decorative floral faux stone pedestals. 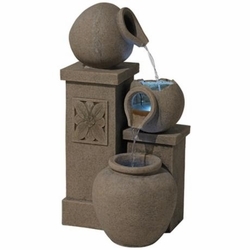 • Indoor/outdoor illuminated water fountain. • Sandstone finish inside and out. • Includes two 3-light LED clusters. • Includes fountain water pump.